How Do You Find the Volume of a Box Whose Sides are Monomials? This tutorial shows you how to find the volume of a box. The fun part? The measurement of each side is a monomial! Watch this tutorial to see how to find the product of three monomials. What are the Associative Properties of Addition and Multiplication? The associative property is one of those fundamental properties of math that make math work. 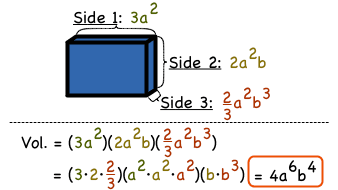 You probably take this property for granted because it's so ingrained, but it's important to see how the guts of math work, so check out the tutorial and make sure you're solid on your fundamentals! What's the Product of Powers Rule? Working with exponents can be lots of fun, as long as you understand how they work. In this tutorial you'll see how exponents add when you multiply the same number raised to different exponents! How Do You Solve a Word Problem by Multiplying Trinomials? Word problems allow you to see the real world uses of math! In this tutorial, learn how to find the area of a quilt using polynomials as the measurement of each side. How Do You Solve a Word Problem by Subtracting and Multiplying Polynomials? Word problems let you see math in action! In this tutorial, you'll see how to solve a word problem by multiplying and subtracting polynomials. Check it out!